1. Domestic airline Bangkok Airways has numerous daily flights connecting Bangkok with Samui. In addition, they have daily flights servicing the Phuket-Samui Chiangmai-Samui, Utapao-Samui, Krabi-Samui routes and international flights to Hongkong and Singapore directly from Samui. 2. Thai Airways now offer a service to/from Bangkok twice a day. 3. If you are on the budget and dont mind adding an extra 3 hours on your journey, then fly with budget airlines Air Asia from Bangkok to Surat Thani. From Surat Thani you get the bus to Donsak pier and ferry to Samui. 4. If your next destination is Malaysia, or if you are coming from there - then you can fly to/from Samui directly to Kuala Lumpur with Firefly or Berjaya Air. When travelling from Bangkok to Samui, I advise that you get a night sleeper train. These trains are more comfortable and ensure smoother bus and ferry connections. It is better to buy a combination ticket which will include all you transport right through to Samui. Train tickets vary in price depending on the carriage class and whether the carriage is air-conditioned or fan. All trains run from Hualamphong Station. Surat Thani Railway Station is 12 kilometres from town. A bus service between the station, Suratthani town and Donsak pier is available. The public buses are slower and much more tiring than the private air-conditioned coaches run by numerous companies, especially for long distance travel. To go to Suratthani from Bangkok it is better to choose between two types of buses: the Luxury buses with toilets and aircon and the VIP buses with two floors, a toilet and air con, you'll get here much more relaxed than with the cheap bus. Bangkok is serviced by several main long distance bus terminals. Mo Chit, in the North, is the largest and busiest since it services Northern and Northeastern Thailand. From here there are limited services to other parts of Thailand. To get to it you need to catch the skytrain to the end of the line at Mor Chit/Chatuchak market and then take a 10 minute taxi ride to the terminal. Buses leave frequently throughout the day, including to Ayuthaya and Kanchanaburi. FOR SAMUI - The newly renovated Southern bus station is across the river in Thon Buri, servicing destinations to the South and West, and is best reached by taxi. The Eastern bus station besides the Ekkamai skytrain station services Pattaya, Koh Samet, Koh Chang and Eastern destinations. If you travel independently and arrive to Suratthani by plane/train/bus - you have to get the bus/taxi from Suratthani to Don Sak Pier where all boats leave from. Don Sak pier is located 40 kilometres from Surat Thani town. Seatran Ferry, Songserm Ferry and Raja Ferry operates ferry services from Don Sak pier to Ko Samui 7 times daily from 8.00 a.m.-7 p.m. It takes 1.30 hours for the journey. Private vehicles can be loaded onto the ferry. Bus services from Surat Thani town and Surat Thani railway station to Don Sak pier are available. Seatran Ferry is the ferry of my choice. All ferries arrive at Nathon town on the west of Samui where you will find taxis and songtaews which will take you to your hotel. You will have to negotiate the price with a taxi driver as Samui's drivers don't understand a word "meter". This is much better and easier option. There are 2 main transfer companies which will take you to/from Samui. 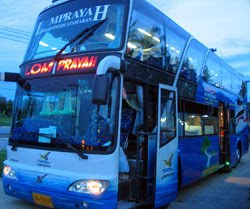 You get all included bus+boat+hotel transfer ticket and comfortable travel to Samui by comfortable buses and boats. will save you time, money and hussle. All ferries arrive at Nathon town on the west of Samui where you will find different forms of transport which will take you to your hotel. Numerous ferries (Seatran, Lompraya, Haadrin Queen, Songserm) depart throughout the day to Koh Phangan (Haad Rin and Thong Sala piers) from the Samui piers in Bangrak, Maenam and Nathon. For more detailed information please follow these links - thank you! Haadrin Queen is a passenger ferry from Big Buddha on Koh Samui to Haadrin Koh Phangan normally departing four times per day. Haadrin - Big Buddha Koh Samui departure times are 0930, 1140, 1430 and 1730. The journey takes approximately one hour. Big Buddha Koh Samui - Haadrin departure times are 1030, 1300, 1600 and 1830. The journey takes approximately one hour. If your destination is Koh Tao then you only have the choice between two companies www.seatrandiscovery.com and www.lomprayah.com. 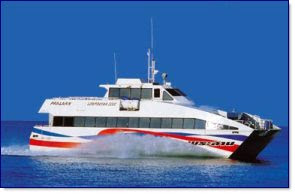 Both companies offer high speed ferry crossing from Samui stopping at Koh Phangan on the way. But the last boat departs each day at about 1:00 pm. If your flight arrives later than this you will have to stay on Samui for one night and then choose between the morning or afternoon ferry the following day. You can take an overnight train from Bangkok's Hualamphong train station, straight through to Chumphon. The trains are inexpensive and comfortable, with a decent bed as long as you book either first or second class. Once you arrive in Chumphon it's easy to arrange a ticket for the short ferry ride across to Koh Tao. But I highly recommend sticking to either the Lomprayah or Seatran ferry services - these are the fastest, most comfortable and reliable ferry services. The Public Transportation Centre of the airport is located near the Bangkok Catering Company Building about 5 min. drive from the passenger terminal. Passengers can find all types of transportation here- limousines, taxis, rented cars and express buses. One can get to the centre from the terminals via a shuttle bus. Bus stops/Остановки: Phetburi Soi 30, Platinum Fashion Mall, Phetburi soi 20, Phetburi Soi 10, Uruphong, Saphan Khao, Thai Airways (Lan Luang), Wat Ratchanadda, Democracy Monument, Royal Hotel, National Theatre, Phra Athit Rd., Phra Sumen, Khao San Rd. 3. Bus routes to/from Suvarnabhumi Airport. 3.3 Buses, which run from Bangkok to other provinces in the Eastern Region, and stop by Suvarnabhumi Airport on the way. Free shuttle bus service is provided for passengers. Express route connects the main terminal directly to the transport center. Ordinary route connects to other airport facilities. Wow, fantastic information you've put up here. In future when friends ask me for travel advice, I will send a link to this page! Well done! Would really appreciate if you spread the word. Thanks!